Today’s clash between Blackpool and Yeovil Town is the Seasiders’ biggest game of the season according to manager Gary Bowyer. Pool currently sit in 12th place in the League Two table, five points off the all-important play-off spots with a game in hand. Bowyer’s men return to league action after causing an FA Cup shock against Barnsley in their replay on Tuesday night; a win which he says his players have to use as a catalyst to climb back up the table. He said: “The players were excited with the win on Tuesday but their attention turned quickly to Yeovil. We had a chat and said the performance levels shows the group what they are capable of. “Now we have to use that as a catalyst to climb back up the table. 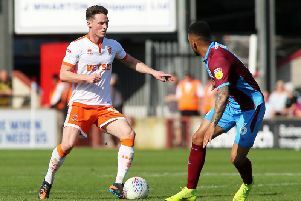 In the reverse fixture, Blackpool came away from Huish Park with an impressive 3-0 win in what was their first victory on the road this season. But, of late, the Seasiders have dropped away from the play-off positions and Bowyer knows they need to get back in the hunt as soon as possible. “To go out and try and gain three points is the most important thing this season because it’s the next game,” he added. “That was the message from the players and as staff we all agreed. “We know the challenge that lies ahead with Yeovil. Obviously we went down there and put in an impressive away performance and we’ve got to produce that again. Bowyer says the team spirit among his Blackpool squad, which saw them shock Barnsley with a 120th minute winner on Tuesday, will be a major asset for his team going forward. He said: “Tuesday was a real big moment in our season in terms of how the players stuck together. “Half-time was really interesting because they took responsibility in terms of what shape they wanted to go out with.